When people think of Thailand, they often think of the bustling streets of Bangkok or the pristine beaches of Southern Thailand. But what happens when you want to get out of Bangkok for a few days? Where do you go when you want to visit a place that’s both rich in history and nature? The answer is Kanchanaburi. The Kanchanaburi Province, which is mostly mountainous terrain, is the third largest province in Thailand after Chiang Mai and Nakhon Rachasima. 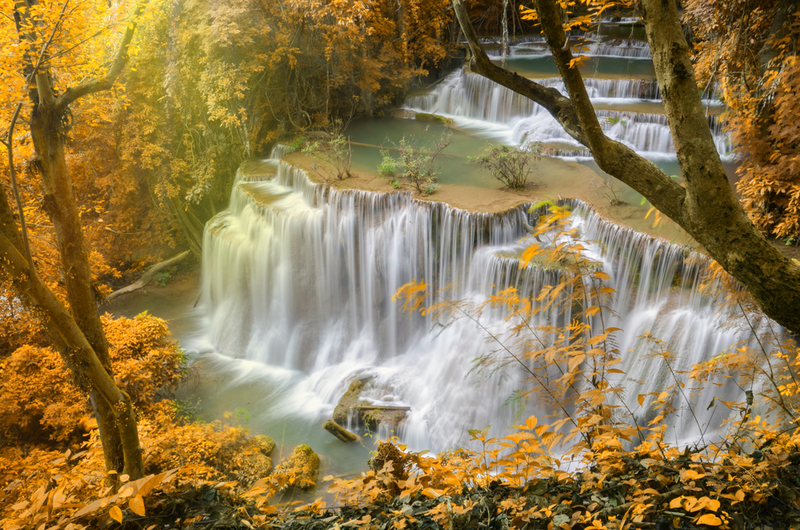 Several of Thailand’s largest waterfalls and most extensive wildlife sanctuaries are found in the province. In addition, Kanchanaburi is known for it’s natural caves, national parks, quiet rivers and untouched forests. While tourism has led to this province being one of the more highly visited in Thailand, most of the locals are of Thai ancestry. Kanchanaburi residents live simply and with a great respect for nature. At just a 3 hour drive away from Bangkok, Kanchanaburi provides an ideal starting point from which to explore Thailand’s West. It is memorable for both it’s natural beauty as well as the role it played in the Second World War. 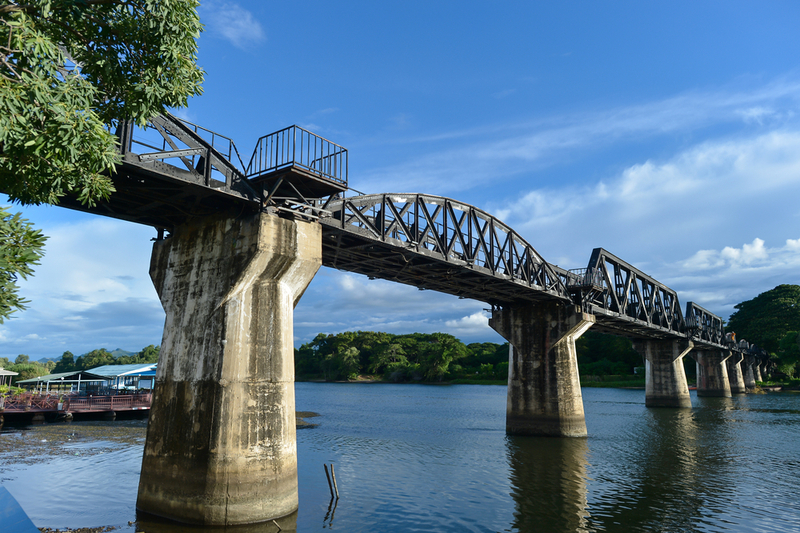 Bridge Over the River Kwai – Popularized in the West in both book and film, the bridge was constructed during the occupation of Thailand by the Japanese Imperial Army and is part of the infamous Death Railway that transported prisoners of war. The iron bridge was transported over from Java by the Japanese and then reassembled by the Allied POWs under Japanese supervision. The bridge remains a popular historical tourist destination and actually provides the backbone for a more relaxed setting than the busy streets of Bangkok. And if you want to keep feeding your historical appetite, Kanchanaburi also boasts many renowned World War II museums. Elephant sanctuaries – Kanchanaburi also features several elephant sanctuaries that are dedicated to the conservation of Thailand’s most revered creatures. Here you can get up close and personal with these majestic animals. Visitors at the sanctuaries are encouraged to feed and bathe the elephants in addition to learning about conservation efforts. Elephant populations in Thailand have gone from around 100,000 elephants at the start of the century, to roughly 3,000 – 4,000 elephants in Thailand today. These sanctuaries help shed more light on the needs of elephant populations in these areas. These sanctuaries can act as elephant rehabilitation camps which provide the animals with better food, improved shelter and proper veterinary care. Often, money raised in these camps is also put towards the education of the mahouts – or elephant caretakers – in the humane treatment of elephants. 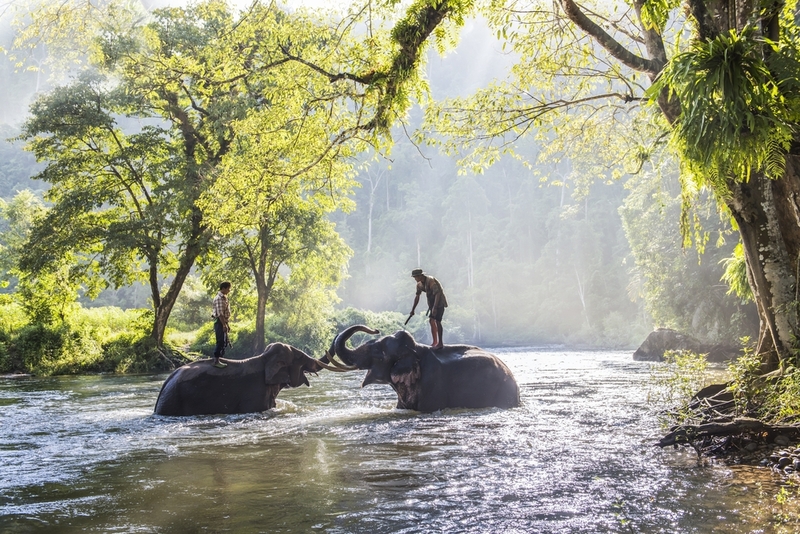 Taweechai Elephant Camp is one of the largest in the area, home to nearly 30 elephants. But that’s not the only elephant sanctuary available to visitors. Elephant’s World, for instance, was ranked number one in Kanchanaburi by TripAdvisor. Muang Sing Elephant Village is another popular destination for those interested in elephant conservation and rehabilitation. The animals aren’t the only focus, however, as often these sanctuaries are set in beautiful natural jungle settings near rivers and streams where swimming and rafting takes place. So, be sure to bring your swimming gear. Erawan National Park – Arguably, one of the most beautiful national parks in Thailand, if not the world. You won’t want to forget your sunscreen! 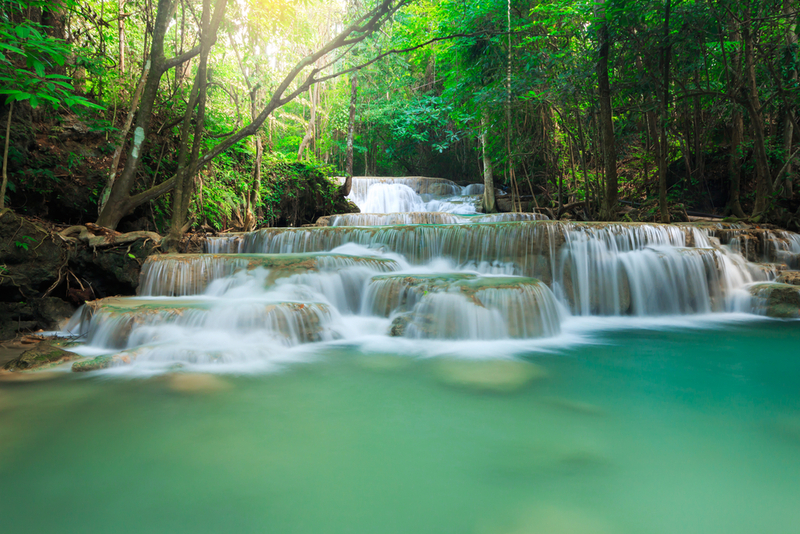 The major attraction at the National Park is the Erawan Falls. They’re named after Erawan, the Thai name for the three-headed white elephant Hindu deity. The waterfalls are beyond breathtaking. There is also plenty of hiking to be done in the National Park. This is a must-see for anyone visiting the Kanchanaburi Province of Thailand. Sangkhlaburi – Located in the Kanchanaburi province, around 4 hours northwest of Bangkok, Sangkhlaburi is a small town that sits on the Burmese border. Many of the sights in Sangkhlaburi were created in the wake of the construction of the Khao Laem Dam, which led to the creation of an artificial lake with seasonal flooding. 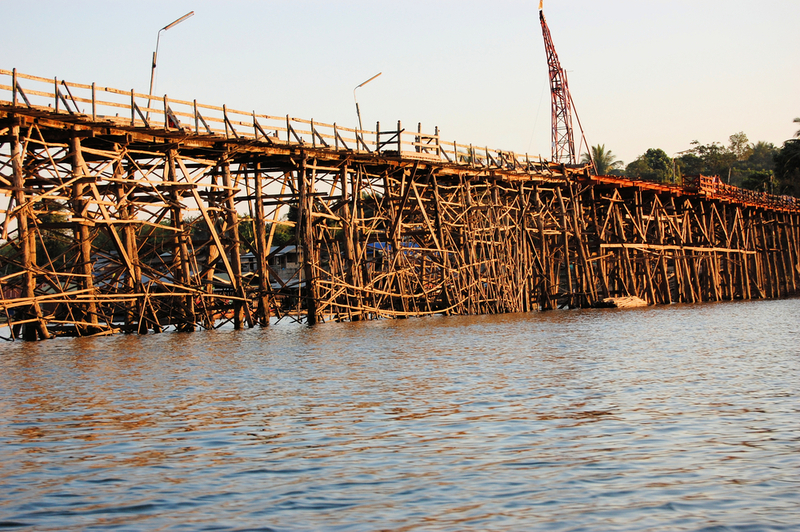 One of the major attractions in this area is Thailand’s longest handmade wooden bridge, which provides a means of travel for villagers to cross the lake. Visitors are welcome to walk across the bridge, named Saphan Mon, or simply people-watch those that traffic the bridge on a daily basis. What’s amazing about this bridge isn’t so much it’s size, but it’s appearance. If I didn’t know better, I’d assume it was assembled over the years by pieces of leftover driftwood. It really is an amazing sight to behold. Sangkhlaburi is also home to another visual treat, Wat Saam Prasob, the sunken temple, which – you guessed it – is submerged due to the building of the same Khao Laem Dam. 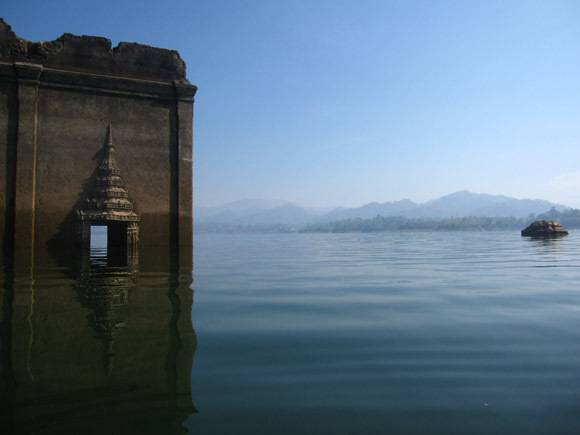 During the wet months, the temple is halfway underwater and visitors can rent boats to see get a good look at the temple up close. In the dry season, visitors are able to walk up to and around the temple. Because the temple is obviously no longer an active place of worship, it was replaced by Wat Wang Wiwekarm on more suitable ground nearby. The temple is considered one of the most revered in the Sangkhlaburi district.